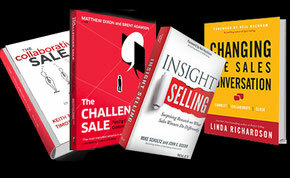 You'd be hard-pressed not to have noticed a marked increase in interest over ‘insight-led’ selling approaches recently. The broad story is that buyers are now contacting sellers later in the buying process. Buyers already know what they want by then and, due to suppliers having little product differentiation, price becomes the main decision factor. Therefore, sellers need to engage more senior decision-makers earlier in their buying process to create differentiation in the sales conversation. They do this using insight which helps the customer better run their business. Such insight creates customer value and greater purchasing loyalty. More and more companies are adopting this strategy for non-transactional B2B sales and it feels like new books covering this subject are arriving thick and fast. Indeed, many industry leaders think we are in the midst of the largest change in selling practices for several decades. Interestingly, there are now several key developments compared to the situation three years ago when one particular insight-based method, ‘Challenger’, was grabbing most of the attention. Broad base of evidence: There is now a range of separate, reputable studies stating that B2B buying is changing, with high-performers using insights as a response. This is creating a more solid and compelling case for change in Sales and Marketing, resulting in suppliers wanting to develop insight-led approaches. Large sample of adopters: Whilst many companies are setting out on the insight selling journey, others have been making investments for several years. Some are struggling and some are succeeding. This is a harder journey than most realise at the outset, albeit one that many companies still know they have to travel to achieve top line growth. Variations over insight-led approaches: Different shades of grey exist for insight-led approaches. These span being disruptive with prospects, adding insight-approaches to solution-selling methods, and using insights to create more value with existing customers, even when there is no short or medium term sale to chase. What is clear is that insight-led approaches will become more widespread. Given the spate of recent book releases on this topic, we thought it would be useful to provide a high-level perspective and comparison on what these big titles are saying. Since three of these titles have a foreword by Professor Neil Rackham, its clear that this is a topic with real momentum. The Challenger approach has been embraced by many leading companies. However, it is also viewed by many as too simplistic and polarised in relation to how to sell. It plays down the importance of asking questions and appears not to sufficiently address when to use insights (versus sell to customers' identified needs). Many people complain that such insight-led selling is not new (a gripe amplified by the marketing hyperbole surrounding the book). Whatever your thoughts, Challenger is a book that has changed things. Whether its key points are actually new is maybe the wrong question. What is clear is that many Commercial Heads in Fortune Global 500 companies around the world found them to be new. Such corporates realised they have not been advising their customers and enlightening decision-makers with robust insights. How the Internet has resulted in customers' learning about how to fix issues and decide what to buy, with less of a need for them to engage with sellers early on. 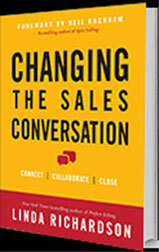 Whether or not you have read The Challenger Sale, it is likely that most commercial leaders would get some value from reading Changing the Sales Conversation. 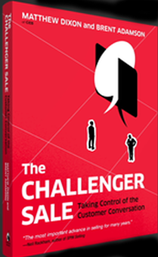 Some will feel this book presents a more acceptable approach to selling for their organisation. However, those who are passionate about Challenger may feel Linda Richardson’s book dilutes the importance of using disruptive insights to differentiate in tough markets. Insight Selling also sets out six example buying personas and nicely guides readers how to use insight-led techniques with each. Additionally, it provides some implementation points and states that 85%-90% of sales training has no impact after 120 days – a stark message for those thinking some sales training is the fix! This book firmly pushes back on some of the claims made by the Challenger marketing machine. In particular, Insight Selling states that solution selling is not dead, but just needs to be built on and adapted to a world where understanding customers’ identified needs is now only the price of entry to prospecting. Whilst some ISMM members may be put off by the US-centric case studies and quotes in this book [those members with pure UK remits], most will find the key story resonates in European markets. A number of points seem to gel with concepts of insight-selling, including a reference to a great 'teaching' example from a seller of industrial gases. The authors also highlight that early engagers win 5x more business. However, there are also big differences versus some forms of insight-led selling, with the authors stating - as per the title - that collaboration with the buyer is the way to go. Key messages include: Don't disrupt the buyer's thinking; partner with them on their journey to find a solution; and, understand their issues (but be prepared to influence the buyer with new ideas and insights). Given the success of solution-selling approaches, it's also understandable that this book anchors its new thinking on that proven base. The Collaborative Sale should appeal to the large community of solution selling practitioners who find that approach is still valid, but wish to build on it in response to today's changed landscape. So, there you have some independent perspective on insight selling, a subject you will only being hearing more about. Where does this leave your organisation? This is a Sales and Marketing subject. Both need to drive the change. Other functions also need to get involved in order to unearth your organisation’s intellectual capital. What does your company know that your customers don’t fully comprehend? That question is the basis for an insight that leverages your position of having many accounts and experiences. Sales training is likely to be just one minor part of getting this right. Don’t invest in training thinking that is the solution. Sustain, sustain, sustain. We've all seen plenty of exciting past changes to the sales approach run out of steam. This is no different - I've spoken with lots of companies experiencing pain after implementing insight-led approaches, in addition to some who are flying and seeing great sales growth. Key is having accessible, engaging and evolving conversation-ready content together with leadership and sales management reinforcing required behaviours.